Supporters of president defend his appointments citing poor state of judiciary - but such an excuse is unacceptable. What is the purpose of the constitution of the Democratic Republic of Congo if it is constantly violated by those who should ensure its application? That's what happened on February 9 when President Joseph Kabila put out to pasture 92 judges and prosecutors, including the supreme court chief and the attorney general, and replaced them with 26 appointees. Many judges went on strike, saying Kabila's move was an attack on the constitution and an independent judiciary, and courts in the capital Kinshasa and several provinces were closed. After a week, the judges ended the strike following agreement on a compromise with Kabila. This presidential order appointing new magistrates was unconstitutional and unlawful. There is no doubt about this. Under articles articles 150 and 152 of Congo's constitution it is only the High Council of Magistrates [Conseil Supérieur de la Magistrature] - the judiciary's top governing body - that can hire, fire or retire judges. The president of the republic appoints judges on the advice of this body, not that of the minister of justice. Admittedly, the High Council of Magistrates has not yet been set up, even though it was given the go ahead in 2006 - but the president should not take advantage of this delay to violate the constitution. Besides, the failure to establish the judicial governing body is a consequence of lack of political will in Kinshasa. Reacting to criticism raised in the aftermath of the appointments, the minister of justice defended the move by citing the serious malfunctioning of Congo's justice system. There is little doubt that the Congolese judiciary is in bad shape, and it is important to ask questions about the troubles that are eroding the judiciary. This is necessary for a better future. Indeed, the problems faced by the Congolese courts are numerous. The breakdown of our legal system is the reason the International Criminal Court, ICC, stepped in to bring to justice those accused of war crimes in the Congo. 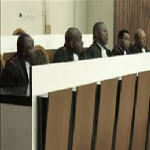 Three accused warlords are in Hague prison cells because the Congo judiciary could not cope for various reasons. First there is a human resources problem. Congo is enormous - five times the size of France - and there simply aren't enough judges to go around. That means those seeking justice often must travel for many miles to find a judge to hear their case. In areas where roads are non-existent and violence still plaguing the countryside, this is a significant - insurmountable - barrier for many. There is also a facililities problem. Judges work in terrible conditions, and many are poorly educated. There is no school for judicial system employees. As a consequence, students leave school with a law degree and begin immediately working as magistrates without proper preparation. At the root of all problems, however, is a lack of pay for judges. They are barely remunerated and that means in many courtrooms justice is for sale to the highest bidder. How can a mission as difficult as rendering justice be given to people without paying them properly. As the saying goes, Congolese judges are caught between justice and survival. A judge has, on one hand, his job to deliver justice but he must also find some way to live and to feed his family. The question one might ask is whether this malfunctioning can justify the violation of the constitution from someone who is, in theory, supposed to see that it is applied. It does not. It is too bad that in the DRC the president is the first to violate the constitution, and this should be condemned whatever the motives may have been. As in the Mobutu era, Kabila has appointed people to senior magistrate positions without first consulting the High Council of Magistrates, violating the principle of the separation of powers and infringing on the independence of the judiciary. It is not in violating the law that we can ensure a better future for our judiciary and strengthen the accession to a real rule of law system. Eugène Bakama Bope is the president of the Friends of the Law in Congo.